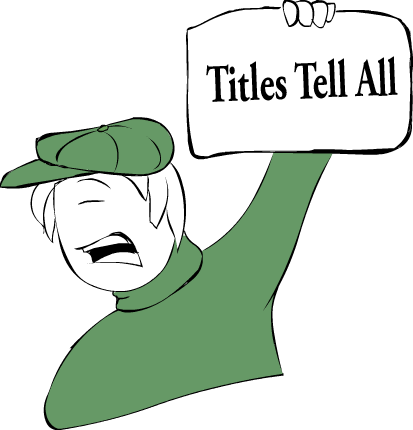 My colleague has an obsession about titles – and it is starting to rub off on me. Any time our graduate students present their work, the first thing that grabs her (and now my) attention is the title – the opening slide on the Powerpoint presentation. She declares that clarity of title indicates clarity of thought. It tells us whether they have mastered what they are talking about themselves. A woolly title indicates woolly thinking. As a result of her indoctrination I have included as part of a regression write-up, that students are required to provide a suitable title. They are graded on it. Their titles include “Regression Analysis”,“Relationship between mileage and price of used cars”and “Height does not affect salary.” These titles are indicative of their level of understanding. “Regression Analysis” is a poor title that tells only the technique, without the context. It is popular among students who have not learned that statistical analysis occurs within a context. They are still focussed on the process rather than the purpose. Their write-ups tend to be narratives of what they have done, in the order that they did it. I call it (a little unkindly) a “what I did in the holidays” report. They may have done a considerable amount of work and really want me to know how much they have done. 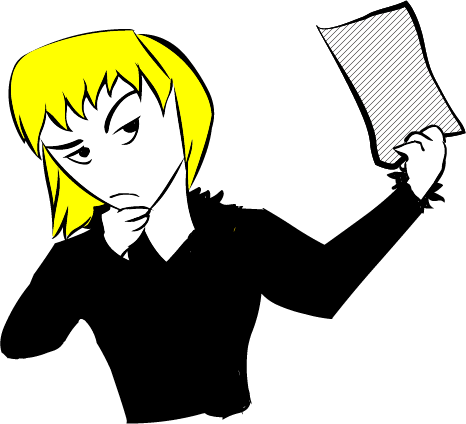 Their reports are often quite repetitious and cover every last detail, without anything to tie it together. The report may be correct, but seldom has insight. A better title is “Relationship between mileage and price of used cars”. This student has worked out what it is that they are examining. They often have very good reports, though they tend to stick to the “facts” and do not roam into the murky world of implications. There is very little of their own thinking in the report. Again there is a tendency to try to include every last detail. And they like to leave the punchline to last. They want to build up suspense, like a detective novel, until in one dramatic flourish, the outcome is revealed. This will not work in many real world settings. I tell my students that everything important they have to say must be on the first page, or it won’t get read. Which is why I like titles such as “Height does not affect salary,” “New phone owners text more” and “Men prefer milk chocolate”. These titles are catchy and tell us the outcome. This is not to say that students get away with unsupported assertions. There must be correct statistical evidence for any of their statements. But I like a bit of courage. And a short report that sticks to the important stuff shows the courage to leave out or report only briefly, some of their analysis and trust that I know they did it. Think again before calling a report "Statistical Analysis". This has been a rather simplistic approach to titles (and reports). In reality the style and content of the title is also influenced by the purpose of the analysis and the intended audience. There is a tendency towards catchy titles in academic papers, for the obvious reason that we want people to remember our paper and cite it. Newspaper titles must be short, and can lack precision. The purpose of this post, however is to draw instructors‘ attention to the production of titles as a means of assessing understanding, both formally and informally, such as in class. And for students, I hope it makes you think again before you give your analysis the title, “Statistical Analysis”!